What is “Little Leaguer’s Elbow”? The term “Little Leaguer’s Elbow” refers to a stress response that happens to the inside part of the elbow from increased stress from throwing. 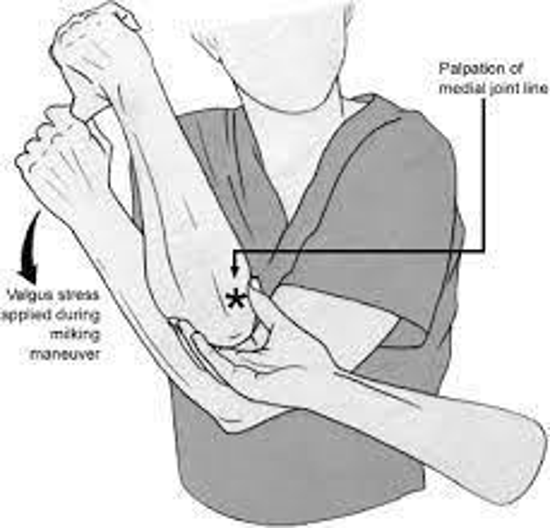 The clinical term medial apophysitis refers to the inflammation or swelling and irritation of the growth plate (apophysis) on the inside part of the elbow. The elbow gets irritated when young throwing athletes stress their arm repeatedly in the cocking phase (reaching back) of a throw. 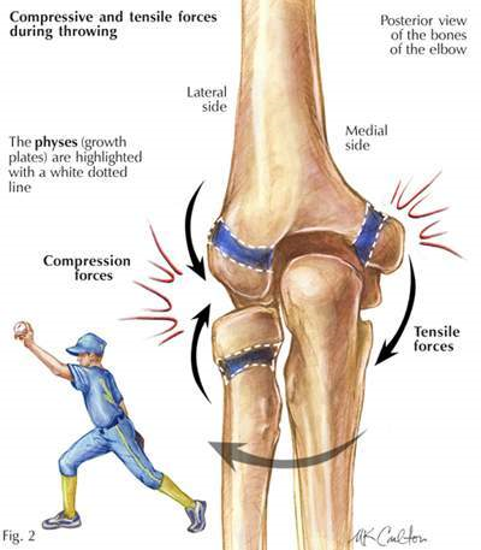 As an athlete reaches back to throw, there is a force on the inside of the elbow (valgus stress) which puts added strain on the growth plate and can cause inflammation. At the same time, there can be a compressive force that occurs on the outside of the elbow as well. This is different from a UCL (ulnar collateral ligament) injury that most baseball players associate with Tommy John injuries, since no ligaments are torn in LL elbow. In general, younger pitchers tend to injure growth plates while older and more developmentally mature pitchers tend to be more likely to tear their ligaments requiring a UCL reconstruction (Tommy John surgery). General causes of elbow pain in youth baseball players include poor throwing mechanics (overusing the arm while underusing the lower body), lack of proper time away from throwing (3-4 months is recommended), poor posture, and a lack of strength in the legs or trunk. While there are not specific exercises to avoid LL elbow, addressing the above risk factors is the key. If a player complains of pain on the inside of the elbow while throwing, they should be taken out and allowed to rest until the pain is no longer present with throwing. A simple and effective test to do is called the milking valgus stress test pictured below. When pulling the hand out to the side, pain in the inside part of the elbow indicates inflamed and irritated tissues and a player should not throw through this pain. If a player continues to throw through elbow pain, there is a much higher risk of sustaining more serious arm injuries.